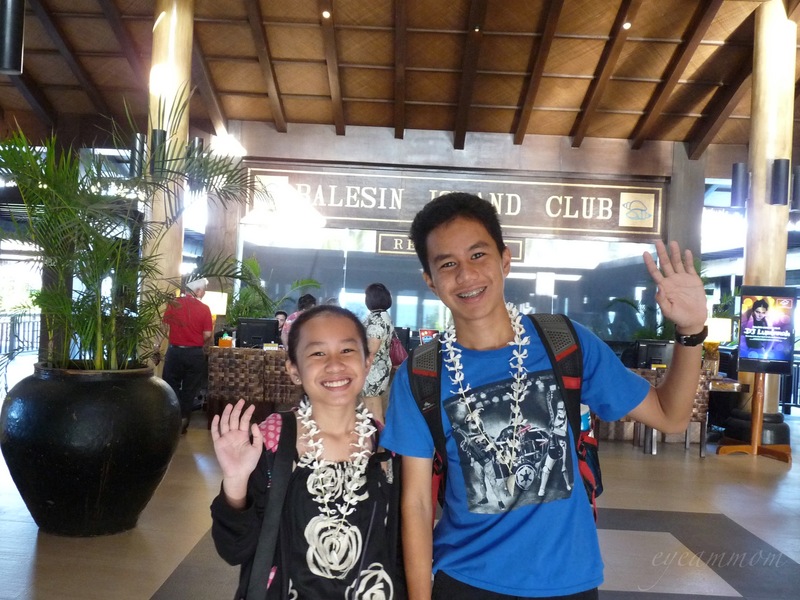 I had written previously about our short stay in Balesin Island Club. I felt that the dining experience merits its own post. Like I said in the other post, guests in Balesin Island Club are free to use the facilities and restaurants of the seven different villages, regardless of where they are staying. 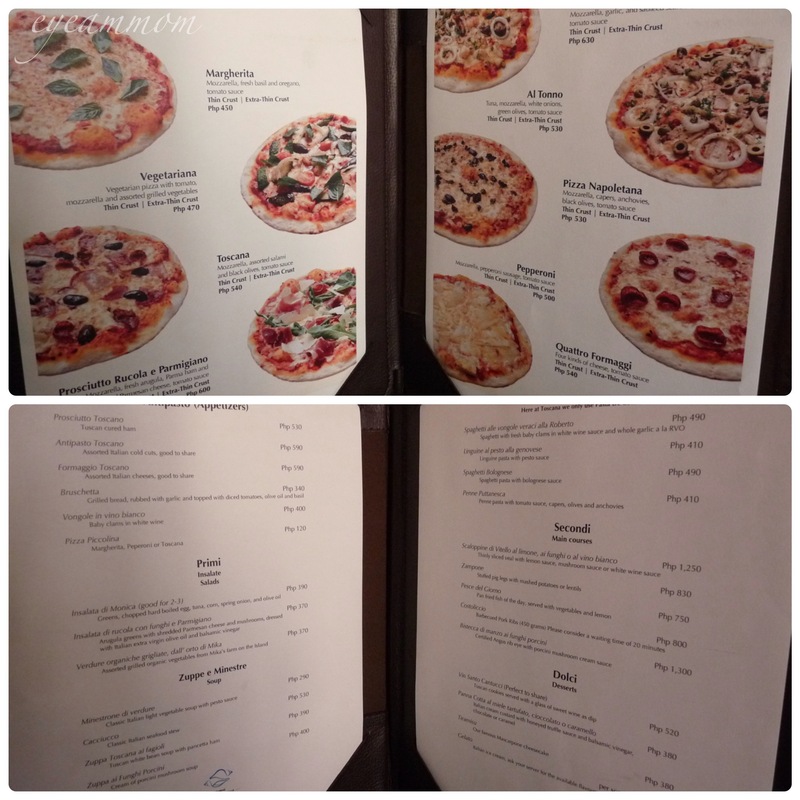 The kids and I tried to sample as many of the restaurants as we could in our short visit. Bong took most of his meals with his faculty workshop group. Our first restaurant was Le Creperie in the St. Tropez village. It was supposed to be the best place for breakfast. We all had the ham and cheese omelette. The omelette was pretty good – lots of mozzarella cheese and very tasty ham. For lunch, the kids wanted to have pizza and pasta, so off we went to La Meridiana in Toscana, the Italian-themed village. We had the Prosciutto Rucola e Parmigiano and the Spaghetti Bolognese. Both were excellent choices. You can tell that they do not scrimp on ingredients. The bread that was served with the pasta was also good. I think they make their own bread in all the restaurants. Dinner was in Casa Grande in Costa del Sol. We were so hungry we forgot to take photos of our food. We had the Beef Salpicado and Callos. The Beef Salpicado was very good – the meat was tender and juicy, cooked just right. The callos, though, was a bit of a disappointment. It wasn’t bad, but we’ve had better. 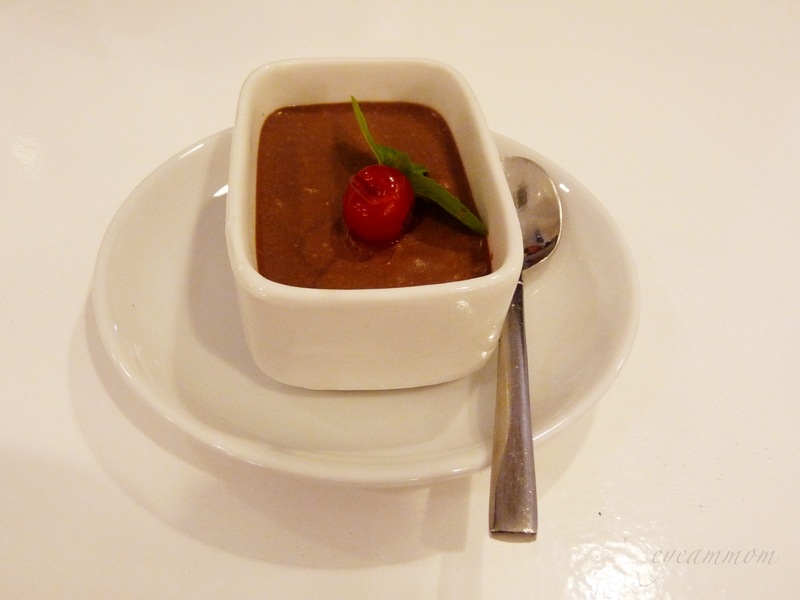 For dessert, we headed back to the Mykonos village restaurant, the Thanassis Taverna, for their “award-winning” Chocolate Mousse. This was another winner! The mousse was rich and creamy, with just the right amount of sweetness. Unlike the other things we ordered so far, the serving size was on the small side for this one. I’m sure my son could have finished more than one if we let him. 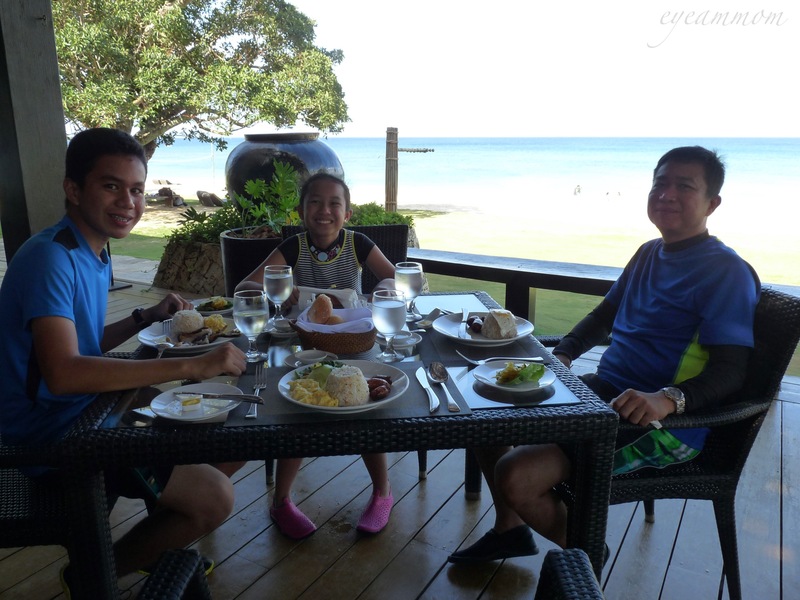 The following day, we had Filipino breakfast at the Balesin Village restaurant, Sala. We had a wonderful view of the beach from our table. We had the Garlic Longganisa, Beef Tapa and Daing na Bangus. All were served with garlic rice and eggs done the way you want them. I liked the beef tapa best – a little sweet, soft and very tasty. We were given a bread basket even if the meals came with rice. The bread was too good to pass up. Our flight back home was scheduled at 1:30 pm so we opted to have an early lunch at the Clubhouse. Nothing fancy, just burgers, since we didn’t want to get stuffed just before flying. The burgers were very good, all meat, no extenders, very juicy. 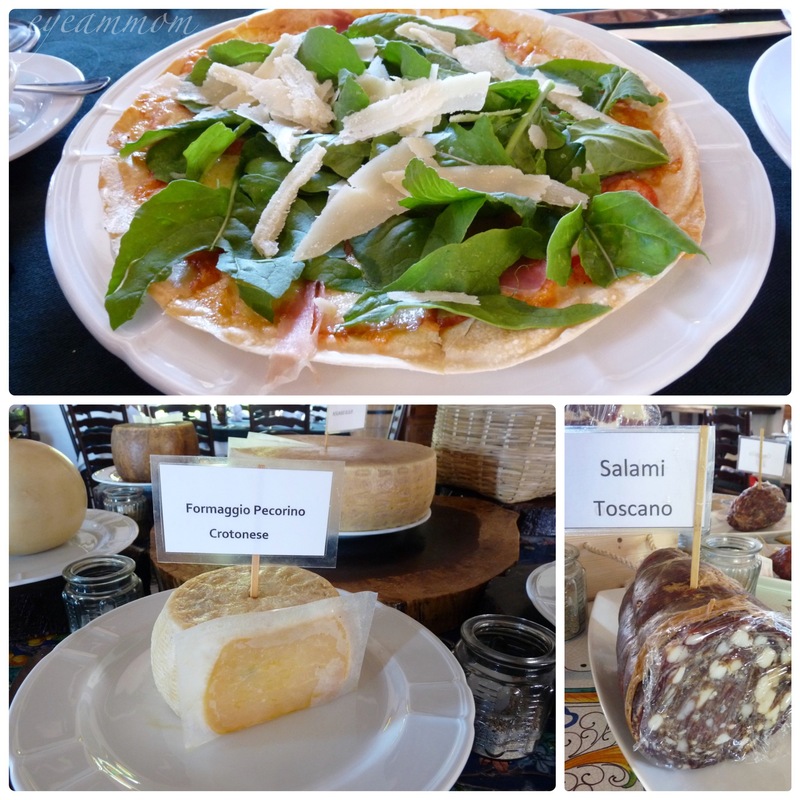 All in all, I would say that Balesin Island Club offers a variety of dining experiences. The food in the different restaurants are very good. Their bread selection, in particular, is excellent. The cost is on the high side, just like in any luxury resort. 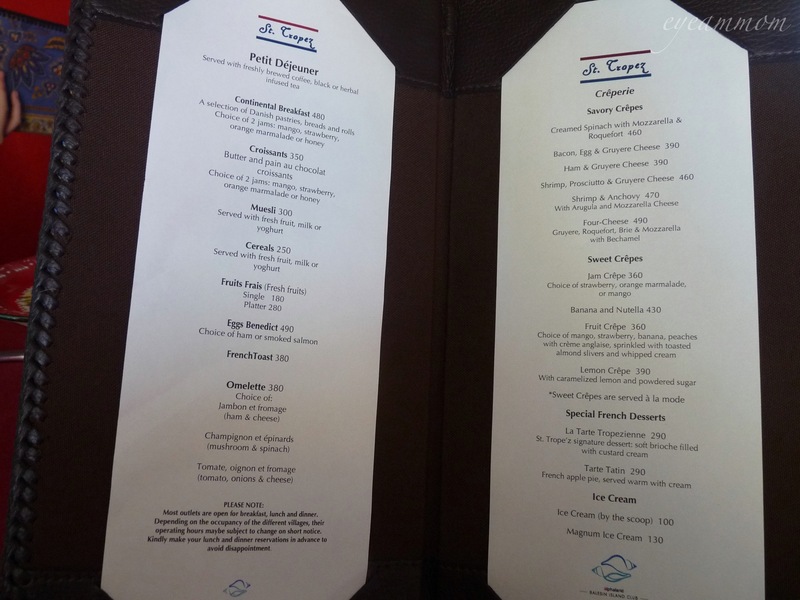 If you find yourself in Balesin Island Club, make sure to try out the different restaurants in the island. It’s like travelling to different parts of the world in one resort. This year’s Faculty Summer Workshop was scheduled to be held in Balesin Island Club. In the past, the kids and I didn’t join Bong for these workshops – he would go and we would stay home. However, when we found out that it was going to be there, we figured this might be the only chance we have to visit that resort. After all, Balesin Island Club is a members-only resort. So even if it was just for an overnight stay, we grabbed the opportunity. 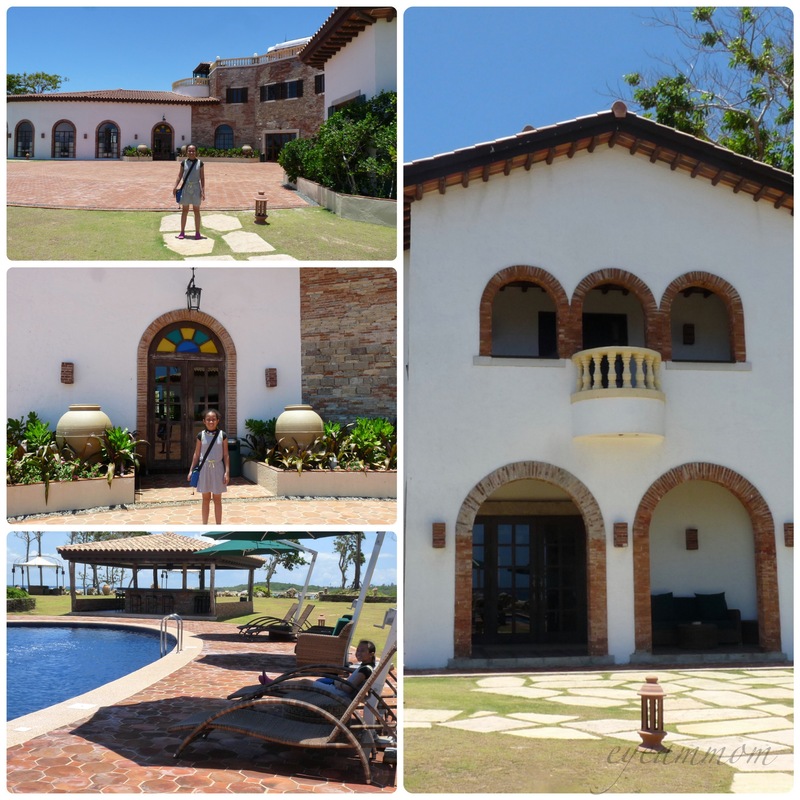 The resort is just a short 20-minute plane ride away from Manila. We left Manila early morning and we were still able to join Bong for breakfast. The resort is made up of seven villages with different themes, all patterned after famous international resorts – Balesin (the Philippine village), Bali, Phuket, Mykonos, St. Tropez, Costa del Sol and Toscana. In each village, the architecture, design, and food reflect the resort that it is named after. In all of these villages, the villas have a king-sized bed, 2 daybeds and a jacuzzi. You are also free to use the facilities of any village, regardless of where you are staying. There are numerous golf carts and customized jeepneys to bring the guests around. 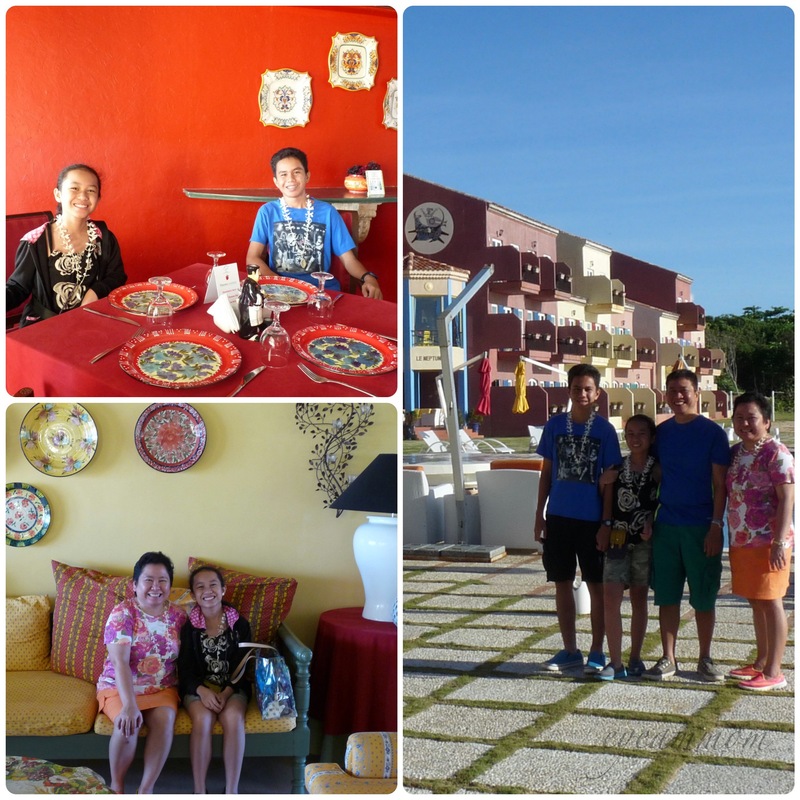 While we were billeted at the Mykonos villas, we went around the other villages for swimming and eating. Our first stop was St. Tropez, the village which was designed after the French Riviera. If I am not mistaken, this is the only village where the lodgings are hotel rooms, instead of villas. After breakfast, we went to the beach of the Balesin village. The beach there was the best among all the villages. They have a long stretch of white sands and pristine waters. Paradise indeed! I could not believe we had this beautiful beach all to ourselves. 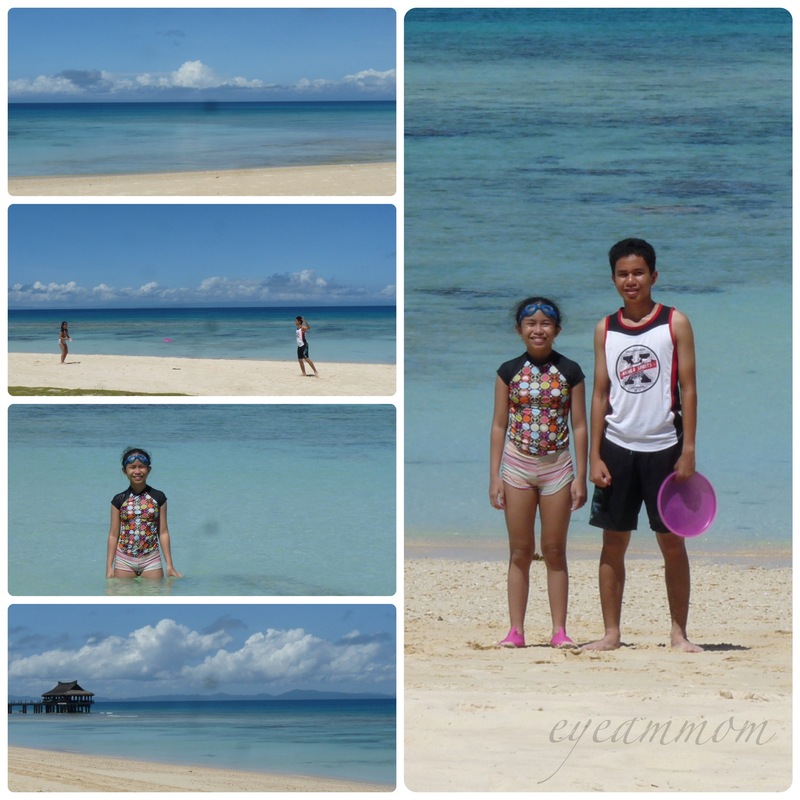 Everything was just perfect – the sun was out, the water was cool and clear, the sand was soft! Pretty soon, it was time for lunch. 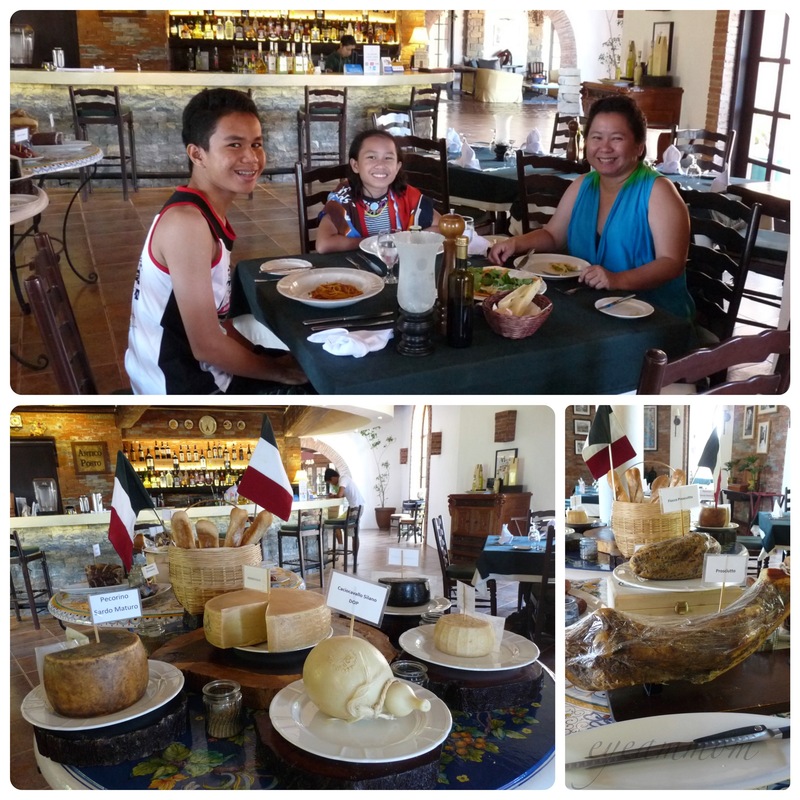 The kids and I went to the Toscana village to have pizza and pasta for lunch. After lunch, we were finally able to go to our room at the Mykonos village.The room was very spacious and could fit four people comfortably. Room amenities included an LCD TV, an iPod dock, alarm clock, safe and slippers. 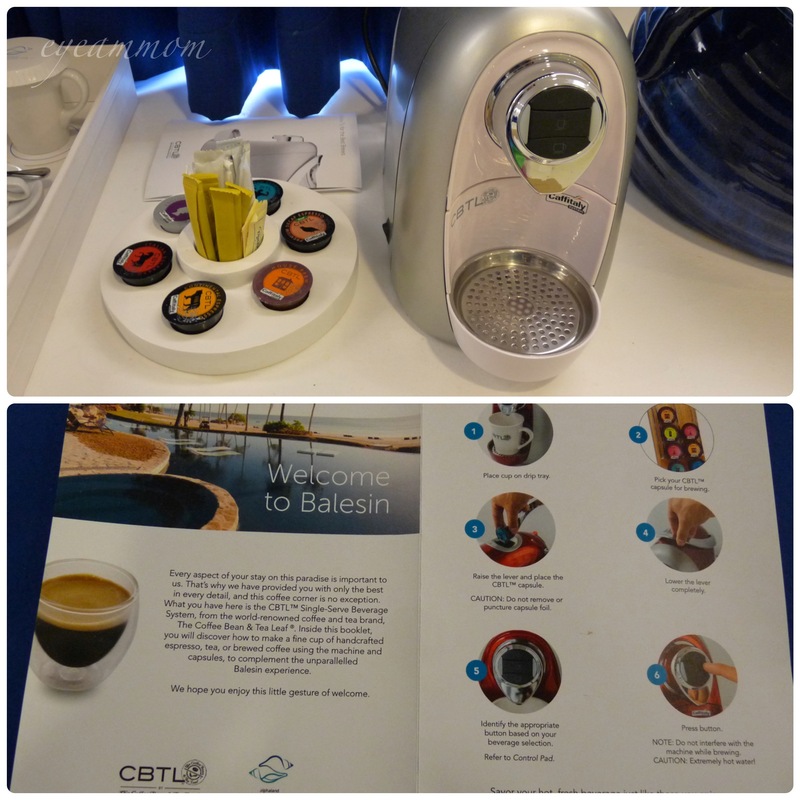 There was also a Coffee Bean and Tea Leaf Nespresso machine – perfect for coffee lovers! The bathroom was just as roomy. 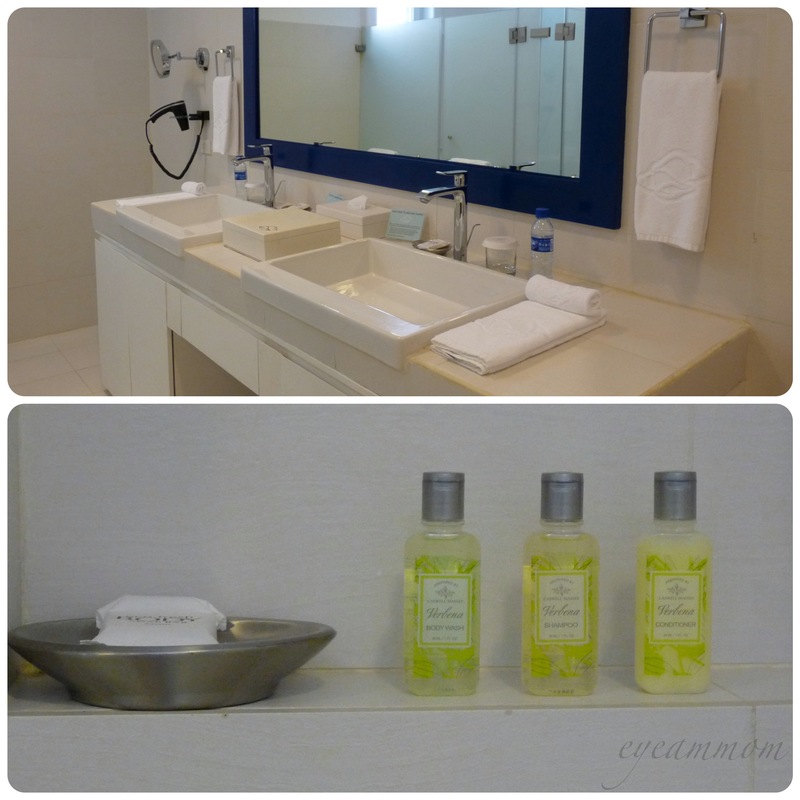 Toiletries were of good quality too. We thought the inside of the room was great. When we stepped outside to the back, we realized that the back of the villa was just as great! 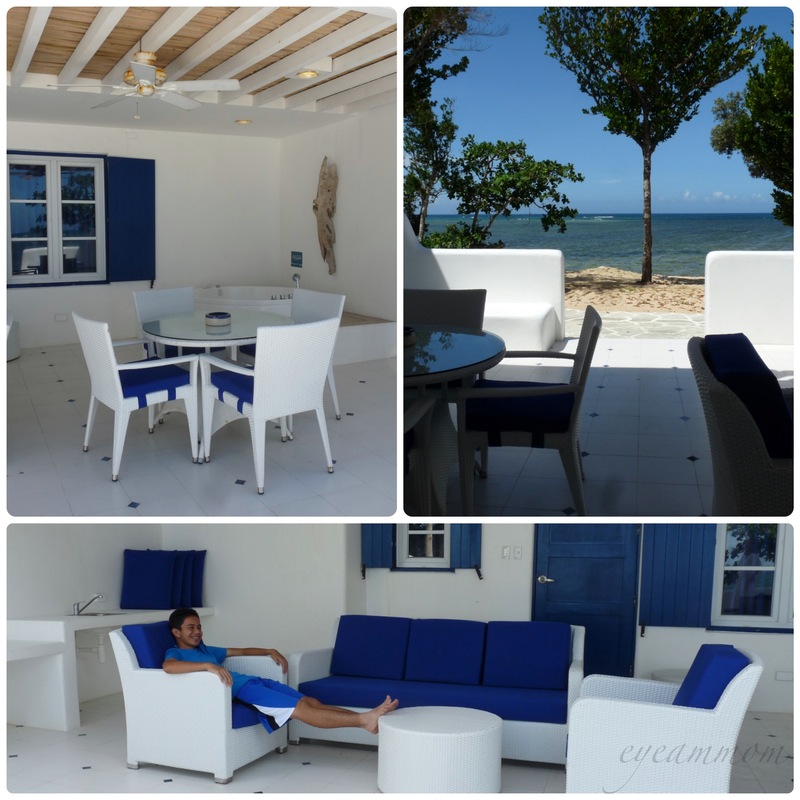 We had our own jacuzzi, a lounge area, a small dining area, access to the beach and the pools just a few steps away. How I wish we could stay here for days! After lounging a bit in the jacuzzi, we decided to explore the swimming pools in the clubhouse Poseidon. On both sides of the main pool were two jacuzzis, both with hot water – perfect to soothe aching bodies. Ours was a very short stay. We had to return to Manila the following day because of previous engagements. Nobody wanted to leave and we were seriously thinking of extending our stay. Balesin Island Club is truly paradise on earth. The beach is lovely, the water is cool and clear, the sand is soft and fine and there are not too many people around. I would really love to come back and stay longer – that is, if I can find someone to invite us.